A HANDSOME surfer and guitarist with a loving family and an international career spanning Australia, New York and Hong Kong, Sydney financial analyst Trent Martin had the kind of life envied by his peers. Now the 33-year-old faces up to 20 years in US jail and a maximum fine of $AU4.8 million for alleged insider trading in which he pocketed just $AU7600. The former Avalon resident and popular former musician is accused of being a central player in a $1 million insider trading scandal relating to computer giant IBM's 2009 acquisition of software company SPSS. 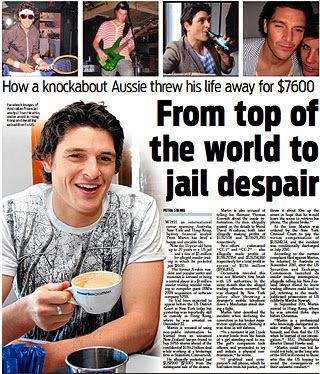 "From top of the world to jail despair", Daily Telegraph, January 4, 2013. Click here to read this story online.